As you may know, DC is in the process of relaunching their universe this month. Not all characters have returned however. Cries, begs, and questions regarding characters such as: the Justice Society (they are coming back), the Marvel/Shazam Family (supposedly coming back as some point), and former Titans Wally West, Donna Troy, Raven, and Beast Boy (...well, two of three ain't bad. Right?) are being made. However, I'm asking for one and I may be the only one making this request - bring back Ralph Dibny, the Elongated Man. The character, created by John Broome and Carmine Infantino, would have been the silver age version of Plastic Man if editor Julius Schwartz knew that DC had owned Quality Comics, Plastic Man's publisher. 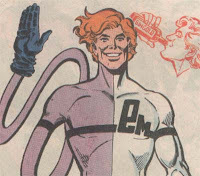 Dibny acquired his powers by drinking Gingold, a soda that works on him differently than others. Why do I want him back? Well, I've always enjoyed the character. 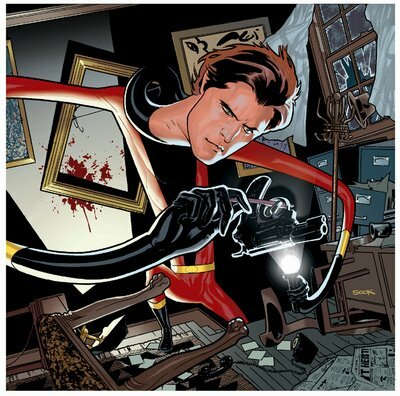 He's some time goofy (not to Plastic Man's extent), but has a detective mind that rivals Batman. And it was cute that his nose twitched when a mystery was afoot. I know some may view him as a joke, but I suggest reading Identity Crisis by Brian Meltzer and Rags Morales. Some of you may remind me that he is dead, but I'll point out two things: (1) so was Ryan Choi (the Atom), but he's back and in the Justice League and (2) this is a relaunch, so he can come back. Will he come back? I don't know. There seems to be a "decree" against similar powered heroes (hence the absence of Wally and Donna). Some have been quick to mentioned 7200 members of the Green Lantern Corps, but they're space cops. However, I will say there shouldn't be four GL members from Earth for one sector. I will also point out that Wildstorm had their versions of Superman and Batman (Apollo and Midnighter), and they survived to see the DCnU. So anything is possible.